My Biome study was done with Nick Tang and Patryk Kuffel. 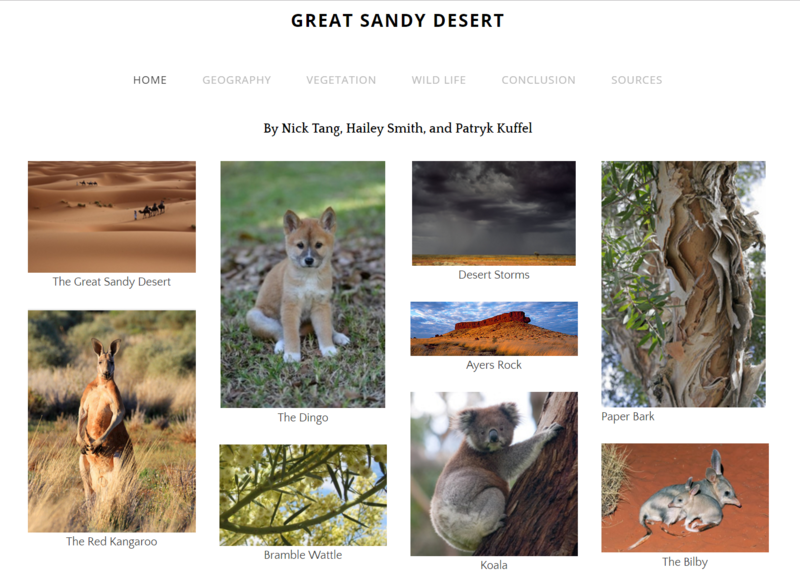 Our project was on the Great Sandy Desert in Australia, we desplayed our resurch using Weebly website creator. I really enjoyed this project and being able to learn about this amazing place. 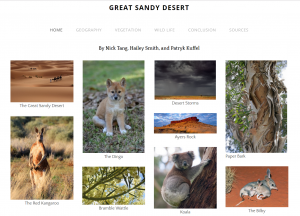 Before this project I never would have thought so much of this desert, but I have really gotten to know the history, landscape, vegitation, and the wild life that is in this area. It is intreaguing to learn about a place so diffrent to what we call home up in canada, learning how things work and by protecting this biome your presurving all it has made itself to be. It is a popular tourist attraction and holds some of the greatest land masses in the world. By losing a place like this it would make a big inpact on the earth.